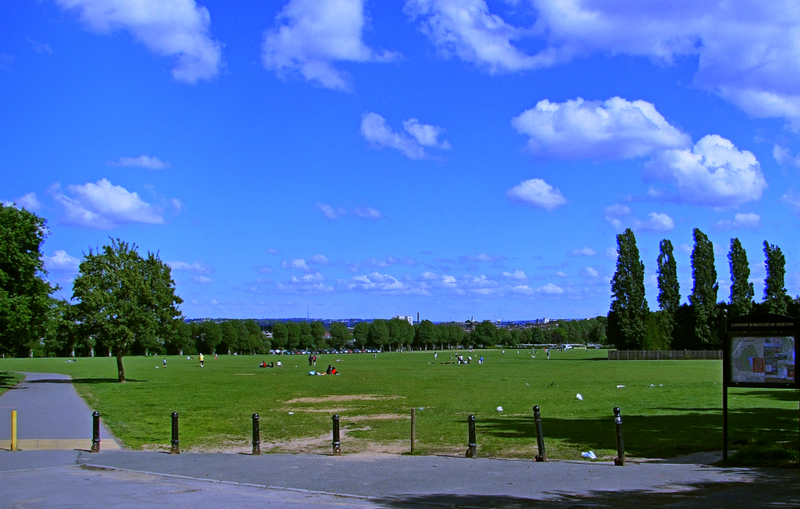 The Wimbledon Championships are starting soon, and for two weeks during the tournament, the area around Southfields becomes rather hectic, a hubbub of activity, as constant streams of people leave the London Underground Southfields station, heading towards the venue. I have posted a few photogrpahs in this article, in the hope that they help to visualize the route for those who wish to join the queue and purchase a ticket at the turnstiles. The following information is based on what I have seen over the past few years, and I doubt it will have changed substantially for this year (2014): I shall amend if necessary. Southfields is the closest London Underground station to tennis courts, and it is found on the Wimbledon branch of the District line (denoted in green on the tube map). The station is in Zone 3. Wimbledon-bound trains run through central London such as Tower Hill and Victoria, and starting from Edgware Road via Notting Hill Gate. All Wimbledon-bound trains stop at Earl’s Court, which is served by the Piccadilly line as well. At Southfields, there will be a constant flow of people exiting the station and know the way, so the best thing might be to follow the crowd! There is a lift (elevator) at this station. Exiting the station, and to join the queue or to enter grounds on foot, you will need to cross the road. It is also possible to take the shuttle bus or a shared taxi, which is convenient for those who already have tickets. To join the queue, it is best to cross the road to the side where you see KFH estate agents, and for ticket-holders, on the other side, i.e. where the NatWest bank and Sainsbury’s are. There will be stewards and police presence, who can provide you with further information. As tickets on the day are purchasable by cash, and there is no bank beyond NatWest until inside the grounds (where there is a branch of HSBC), it may be worth withdrawing money beforehand. There is a cash machine (ATM) near No 1 Gate, but that will be somewhat out of way from the queue. In addition to NatWest, there are also branches of HSBC and Barclays near Southfields station. There are also shops, including a branch of Sainsbury’s as already mentioned above and Tesco down Replingham Road, and it may be a good idea to purchase food and drink to consume while queuing. These signs tell you which direction to go, and how long it will take to reach the queue or the grounds. These are placed near Southfields station. 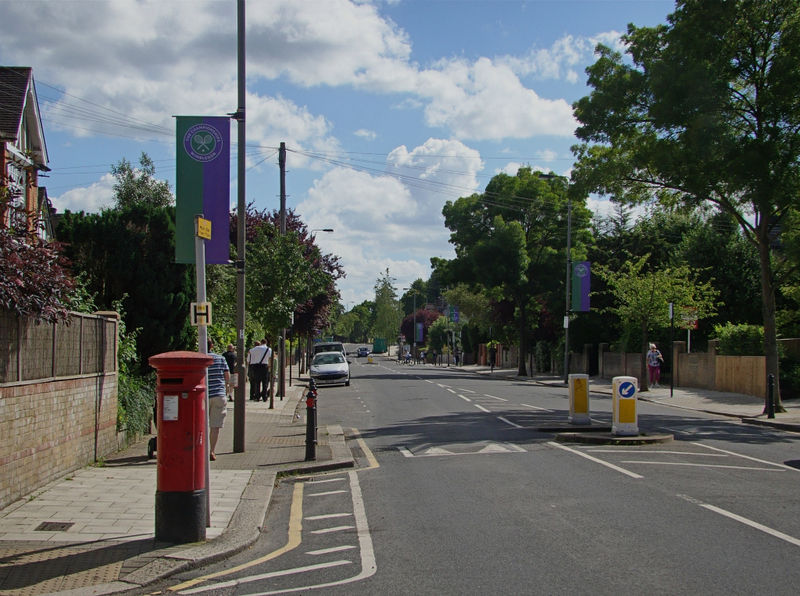 Wimbledon Park Road is a relatively broad street and it is not particularly arduous, though there is a small climb and descent, heading towards the grounds. The queue forms in Wimbledon Park, and there are stewards who will guide you and issue with a queue card: do not lose this card, as it is checked to see if you have queued properly or not. This is a picture from 2013. The queues were at times extraordinarily long. There are vans that sell food and drink, and the queue can be very slow-moving, as once the ground capacity is filled, Wimbledon operates on a one in, one out principle. The queue will move inside Wimbledon Park Golf Club, and there will be a security check, similar to what you go through at an airport, and you will cross a bridge to go to the other side of the road, before reaching Gate 3 where the turnstiles are located. On the first few days of the tournament, there are many good matches scheduled on outer courts. No 3 court has a secion that is unreserved, and courts No 12 and 18 have many unreserved seats: be prepared for the mad dash to secure these seats, when the grounds become open to the public.